Quilt. Fabric. Ladder. Root. Lemonade. 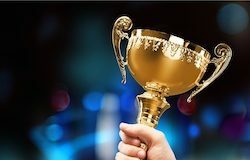 If you know what these words have in common, you’re doing a pretty good job keeping up with newer entrants into the insurance market. Yep, if you’re going to be an insurtech startup these days, it seems you need to have a one-word name with no immediate discernable connection to insurance. Our latest look at what’s up with some of these potential disruptors provides updates on some new digital life insurance products, accidental death coverage aimed at young parents, a progress report on homeowners/renters insurance carrier Lemonade, and expansion for a “good driver only” mobile-based auto insurer. They’re frequently partnering with existing carriers, or receiving investments from them. They’re all set on disrupting the traditional process of obtaining insurance, and generally they’ve got their sights set squarely on the mobile-crazy Millennial market. 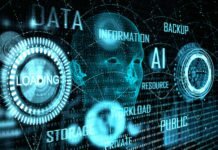 New York-based Lemonade, the homeowners and renters insurance company “powered by artificial intelligence and behavioral economics,” recently released the latest of its “Transparency Chronicles” and announced a strategic investment by Allianz. Last December, based on its initial launch results, Lemonade set a target of having 13,000 customers by the end of 2017. “We modeled this based on the rapid growth of our first days in-market. We thought it was aggressive, but doable,” said Lemonade cofounder Shai Wininger in his June 1 Transparency Chronicle update. As of June 1, Lemonade stood at 14,315 homes insured, beating its target seven months early. Data in the Transparency Chronicle shows 21.5% of Lemonade’s clients switched from GEICO, 20.5% from State Farm, 17.1% from Allstate, 10.5% from Liberty Mutual, 5% from Progressive and the rest from companies like Farmers, USAA and others. Wininger also announced that Lemonade is now licensed in an additional seven states – Texas, New Jersey, Michigan, Arizona, North Carolina, Virginia and Rhode Island – and will be launching there soon. Those states will join New York, California and Illinois, where Lemonade is already available. Finally, Lemonade recently announced a strategic investment by Allianz, the world’s largest insurance company. Details of the investment have not been disclosed. Ladder, an insurtech startup that introduced what it calls “instant, simple and smart life insurance” earlier this year, recently announced a new addition to its product that “makes life insurance dynamic” using Ladder’s self-service dashboard. 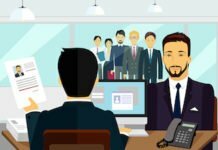 The Palo Alto, Calif.-based company, which issued over $100 million of coverage in its first 100 days, said in a statement announcing the addition that it is “continuing to quickly innovate its platform to deliver further control and flexibility for consumers.” In addition to securing coverage in minutes – versus the industry average eight-week process – customers can now decrease their coverage whenever they choose to better match their needs. The amount of life insurance coverage people need fluctuates based on various life stages and events. For example, a 30-year-old with a young baby may want more coverage in place in order to provide for their child. With Ladder, they can log into their account, apply for more coverage (up to $8M), and get a decision instantly. Conversely, someone with older children and a fully paid-off mortgage may no longer need as much coverage since more of their expenses are behind them. Ladder enables them to dial down that coverage as they wish, with no fees or penalties. About Ladder: Ladder is life insurance built to be instant, simple, and smart. Founded in 2015, Ladder has designed a digital-first life insurance product to serve today’s financially savvy consumer. For more information visit www.ladderlife.com. Brooklyn-based insurtech startup Fabric, which is targeting young parents with its “start-to-covered in two minutes” accidental death policies, recently announced its availability in New York. 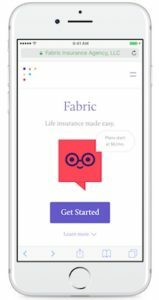 Since March of this year, Fabric has been using its proprietary technology and design “to make buying life insurance easy and affordable for parents across the United States.” With the late May launch in its home state, Fabric is now available in 38 states plus the District of Columbia. Here’s the model: Customers get started with Fabric Instant, which covers them in two minutes for accidental death, which the company notes is life’s single greatest risk for people between 25-44 . Plans start at $6 per month for $100,000 in coverage. Policyholders can upgrade coverage later to include death from accidents and illnesses by replacing Fabric Instant with Fabric Premium, a 20-year term life insurance policy offering up to $5,000,000 in coverage. The company says this means when busy parents want coverage, they can quickly and affordably check life insurance off their list with Fabric. “We found that 93% of our customers purchased coverage within five minutes of their first visit, from start-to-covered,” said Steven Surgnier, Fabric CTO and Co-Founder. Many parents buy Fabric Instant and then immediately move to upgrade their coverage by applying for Fabric Premium. Others choose to keep Fabric Instant for the long haul – you can keep Fabric Instant until age 60. CDC: National Vital Statistics Report, Volume 64, Number 2. (February 16, 2016), Table 9. About Fabric: Fabric believes that every family deserves a secure financial future. Together with a group of world-class investors led by Bessemer Venture Partners and an ever-growing team of data, technology, and insurance professionals, Fabric is committed to bringing life insurance into the modern age with an experience that is fast, affordable, and easy to navigate. For more information visit https://www.meetfabric.com. 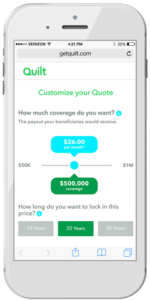 Quilt launched a new life insurance product targeting Millennials at the end of May that is designed around an online application process that takes about 15 minutes. It’s the second product launch for the Boston-based insurtech startup, following the introduction of renter’s insurance last summer. The company plans to enhance its Millennial-focused product line with travel and pet insurance soon. As for the new life insurance product, Quilt provides the “seamless user experience” and the policies are underwritten by Lincoln, Neb.-based Generation Life, an A.M. Best A-rated carrier, recently acquired by Swiss Re, with a 50-year track record. Policies are now available for purchase in 37 states, with nationwide coverage planned in the coming months. Unlike traditional life insurance processes that can take months, eligible customers simply answer a few questions through a secure website, with the digital application taking less than 15 minutes to complete, says the press release announcing the launch. Many of Quilt’s Millennial customers will qualify for online purchase, and those who aren’t eligible for immediate approval can still start the process online. “The mission of Quilt is to radically simplify the process of buying and using insurance. We are excited to offer our customers a new way of buying life insurance that reflects our core philosophy without sacrificing on affordability or coverage,” said Blair Baldwin, Quilt co-founder and CEO. Quilt offers consumers a range of coverage and price points to fit their budget, up to $1 million. The new life insurance product is the result of a deep partnership between Quilt and Generation Life to “kickstart the digital insurance revolution” and close the coverage gap among young consumers, according to the release. “We are thrilled about this new collaboration and look forward to working with Quilt. Together we will provide high quality products and services to help more young people get life insurance and protect their families,” said Philip Walker, CEO of Generation Life Insurance. Life insurance is Quilt’s second full product line, following the release of digital renters insurance in 2016. The launch brings Quilt one step closer to its goal of offering a simple, one-stop insurance shop tailored for Millennials, with pet and travel policies coming later this year. The product lines were chosen following extensive market research into the things Millennials care about most. While most insurance companies offer multiple product lines, the combination of renters, life, pet and travel policies is unique to Quilt. The company’s simple buying experience, mobile-first ethos and choice of products were all chosen specifically to address the insurance needs of young people, and represent the company’s vision of a holistic approach to insurance for Millennials. “Many people are initially skeptical of selling life insurance to Millennials. But then they realize Millennials are hitting the age where they marry, buy houses and have children. Life insurance is a natural product for the life stage they are entering by the millions,” Baldwin said. About Quilt: Quilt offers a family of mobile-first insurance products designed to be bought and used online – no talking to agents, no cutting down trees and no complicated user experience. Quilt takes the hassle out of insurance by creating an intuitive buying experience and easy-to-understand products, along with managing the entire customer experience from sign-up through claims. Learn more at getquilt.com. Auto insurance startup Root, based in Columbus, Ohio, announced in May it has expanded to Arizona after a “highly successful” launch in Ohio. Arizona drivers can download Root’s iOS or Android app and take a test drive to determine a personalized rate. Root, which uses mobile data to personalize rates and only insures good drivers, expects to increase the company’s potential reach by 60% with the expansion. Root bills itself as the nation’s first entirely mobile-based car insurance company. 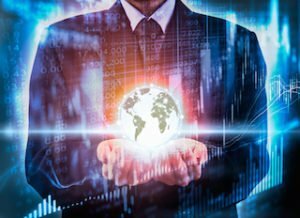 Its data-driven approach ensures drivers receive a quote based primarily on how they actually drive, rather than solely on demographic data (as is the practice of most traditional insurers). To join, users download the iOS or Android app and take a two- to three-week test drive, depending on how much they drive. Upon completion, Root’s proprietary rating engine generates a personalized quote based on the individual risk of the driver and even allows customers to transfer their policy, all through their mobile phone. Since Root doesn’t insure bad drivers, the company says good drivers can save up to 52%. In addition to its unique pricing model, Root made waves throughout the insurance industry in March by announcing it would be the first car insurer to offer a discount for self-driving cars because of their decreased crash risk. The discount is currently available to Tesla owners, but the company plans to extend it to owners of other autonomous vehicles in the future. With the expansion, Root becomes the first insurance carrier to offer such a discount to Arizona drivers. 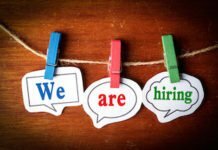 Root plans to expand to more states soon. For more information visit http://www.joinroot.com. If what’s happening in insurtech is important to you, you’ll want to make plans to be in Las Vegas later this year. Approximately 3,000 attendees will converge on Caesar’s Palace in Las Vegas Oct. 3-4 for InsureTech Connect 2017. In the event’s second year, more than 50 sessions featuring more than 200 speakers are scheduled, including keynotes, panel discussions, product releases and demos. 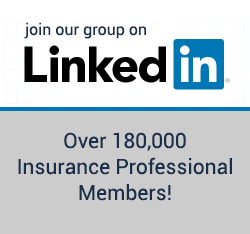 For more information about InsureTech Connect and for access to a special discounted registration rate for Insurance Forums members, click here.